SKC Nursing Department offers Associate of Science in Nursing (ASN) and Bachelor of Science in Nursing (RN-BSN) degrees. Detailed information about our program is provided below as well as in the SKC catalog. Interested in visiting the SKC Nursing Department? We would love to show you around! Please click here to schedule a tour. Students considering pursuing the ASN degree are strongly advised to take Biology, Chemistry, and/or Anatomy and Physiology courses in high school and complete the Certificate of Completion in Health Science Studies that is designed to include the prerequisite courses for admission to the ASN program as well as provide excellent preparation for the Nursing Program. Students may complete the ASN pre-requisite courses at SKC or any other accredited college. However, transfer students should consult with a Pre-Nursing advisor and the Enrollment Services as soon as possible to ensure that the courses completed at another college or university meet the SKC and Nursing Program requirements and will be accepted. Students must complete the following prerequisite courses before applying to the ASN Program. Math and science courses must be taken within five (5) years of the anticipated program start date. Prerequisite and general education courses can be repeated only twice to improve a grade. Please see the Nursing Program section in the SKC catalog for full details. Please contact the following Pre-Nursing advisors, located in the Life Sciences Department in PQLAW (Beaverhead, Sciences Building, to discuss the ASN Program pre-requisite course completion options, to register for classes, or if you have questions about transfer credits or the application process. Please refer to the ASN Admission section for application process details and required documents. Two letters of reference. At least one reference must be completed by an instructor in an ASN pre-requisite course (A & P I and II, English Composition, Psychology, and/or Math). If currently employed in a healthcare related position (e.g. CNA), the immediate supervisor may complete the second reference. Please complete Part I of the form before submitting to an instructor or supervisor. Download the ASN Application and Professional Letter of Reference for Nursing Program Applicant forms below. Please mail, fax, or email the completed application packet materials directly to the Nursing Department. 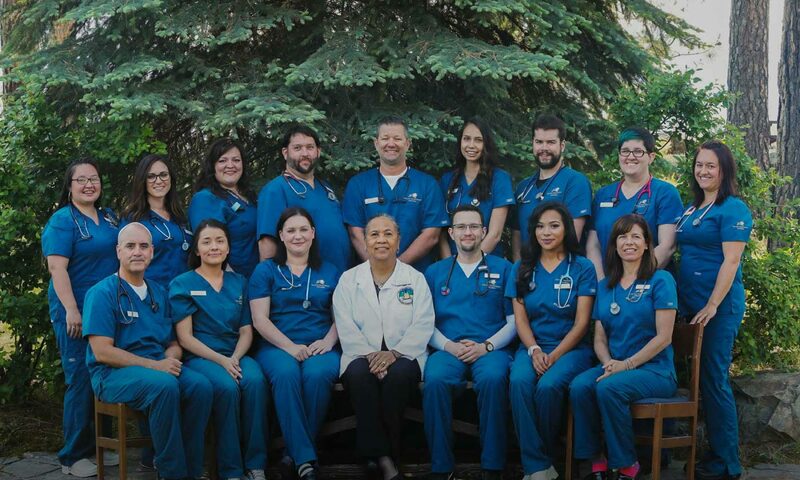 Mail: Attn: Admissions, Nursing Department, Salish Kootenai College, PO Box 70, Pablo, MT 59855 Fax: (406) 275-4806 Email: nursingadmissions@skc.edu ASN Application (printable pdf) ASN Application (fillable pdf for electronic delivery) ASN Letter of Reference (printable pdf) ASN Letter of Reference (fillable pdf for electronic delivery) The following additional documentation must be completed and received by the Enrollment Services by 12 p.m. on June 15th. Please mail the documents directly to the SKC Enrollment Services, P.O. Box 70, Pablo, MT 59855. All official college transcripts that verify the pre-requisite course completion, including the courses completed between May 1st and June 14th. Official copy of high school transcript or GED. Other required SKC admissions documentation. Incomplete application packets (missing required documents or prerequisites) will not be considered for admissions. The Nursing Department will begin screening all completed applications after June 15th. Admission into the Nursing Program is based on grade point average (GPA), admission test score, Native American enrollment status*, and veteran’s priority of service** status. Enrollment in the Nursing Program is limited based on the availability of clinical facilities and faculty. Students are admitted into the Nursing Program once a year in fall quarter. Selection of ASN applicants will be completed by June 30th. Students receive written notification of acceptance status and the acceptance packet by July 10th. The documents contained in the acceptance packet must be completed and returned to the Nursing Department by August 15th. The ASN program prepares students for licensure as a Registered Nurse and for practice in a variety of rural and Native American healthcare settings. Please read the ASN Program Information document carefully for full details about the program. Critical thinking— Utilize critical thinking and evidence-based interventions to coordinate holistic care. Communication— Utilize effective written and verbal communication and information technology to collaborate with health care members, patients, and their families. Culturally congruent care— Provide culturally congruent care to reduce health disparities. Citizenship— Demonstrate citizenship, integrity, self-reflection, and lifelong learning in nursing practice. Complete SKC application and submit any required documents. Complete the BSN application and turn in with an unofficial transcript by the specified deadline. Submit transcripts (if attended other colleges). If Native American / Alaska Native, submit Tribal Verification form. A student must be a Registered Nurse to apply to this program. The following recommended course schedule and required general education and nursing courses are in addition to the student’s earned Associate of Science Degree in Nursing. Download the ASN Application and Professional Letter of Reference for Nursing Program Applicant forms below. Please mail, fax, or email the completed application packet materials directly to the Nursing Department. The following additional documentation must be completed and received by the Enrollment Services by 12 p.m. on June 15th. Please mail the documents directly to the SKC Enrollment Services, P.O. Box 70, Pablo, MT 59855. Admission into the Nursing Program is based on grade point average (GPA), Kaplan Entrance Exam (Minimum of 70%), Native American enrollment status*, and veteran’s priority of service** status.